Manufactured to resist moisture and constructed to take consecutive beatings from all kinds of materials, Penda Bed Liners are an affordable opportunity for you to provide premium protection for your truck without compromising on convenience or design. The perfect option for the truck driver who wants a softer approach to their truck’s exterior, Bedrug Liners look and feel like carpet, but have the strength of their durable counterparts. With water and slip resistance, you can count on this bed liner to keep your materials from shifting during long drives. 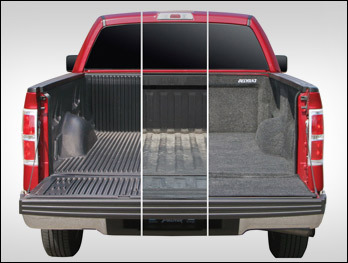 American-made truck bed liners provide affordable protection for all trucks. Made from high quality polyethylene, these liners non-pooling skid resistant floors & tough, patented front corners. The uniform wall thickness maintains durability and sleek appearance. Rugged Liner truck bed liners can be used with Rugged Cover hard or soft folding cover to keep your cargo dry. Contact the truck bed liner suppliers at Cap Connection today for more information on our selection.